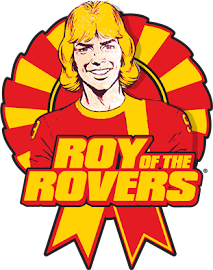 The Greek Roy of the Rovers Fan Club: Can you remember Roy of the Rovers? Can you remember reading your first ever copy of the iconic Roy of the Rovers? I certainly can! Here are a few things you might not have known about the classic comic strip. For those unfamiliar with Roy Race and for those who may have forgotten what all the fuss was about here’s a quick recap on the classic cartoon. 1. Roy of the Rovers first appeared in 1954 in Tiger magazine. The cartoon’s protagonist Roy Race was the star player of Melchester Rovers and soon became an idol to millions. 2. 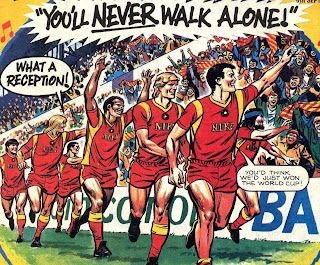 Roy eventually graduated to his own Roy of the Rovers comic, launched in 1976, which also featured football-based strips such as Billy’s Boots, Hot Shot Hamish and Goalkeeper. 3. Strips have also appeared in the now defunct Today newspaper, as well as weekly football mag Shoot! and the Match of the Day magazine. 4. Roy’s footballing career lasted almost 40 years, eventually ending in tragedy in 1993 when a helicopter accident led to the amputation of his foot. 6. In the late 1980s, before it featured the actual Roy of the Rovers strip, Shoot! magazine regularly featured ‘Ray of the Rangers’, a spin-off cartoon. Another spin-off is Viz magazine’s Billy the Fish, which revolves around the fortunes of Fulchester United goalkeeper Billy, a fish with a human head. 7. In 1990 Roy Race teamed up with Gary Lineker to release a record titled Europe United. It was described in the comic as ‘a hot rocking heavy metal rap’, and failed to make the Top 40. 8. A number of Melchester Rovers Subbuteo teams were produced in the 80s and 90s, and there was also an official Roy of the Rovers board game, pineapple-flavoured chew and computer game. 9. Roy Race made a guest appearance on TV sports quiz They Think It’s All Over in 1999, but only as a cardboard cut out. 10. 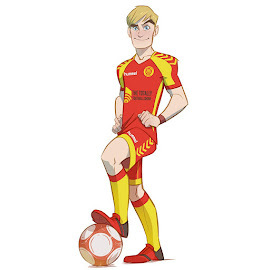 Real life footballers to have appeared in Roy of the Rovers include Bob Wilson, Emlyn Hughes, Sir Alf Ramsey and Trevor Francis, while other celebs featured in the cartoon include Martin Kemp, Geoff Boycott and Des Lynam.